I don’t know how I missed it, but the latest Simplicity releases came out sometime in the past few weeks. Overall I’m not too inspired by the latest collection, though there are a few cute dress patterns, and a really fun doll’s pattern for Disney fans. 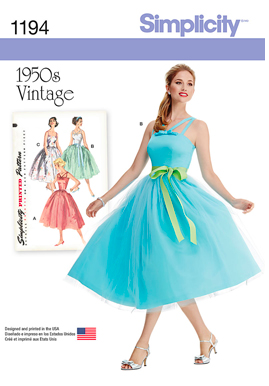 S1194 – I know it’s a basic dress, but I really like this 50s reprint pattern. I really enjoy seeing the original art on the package as well. 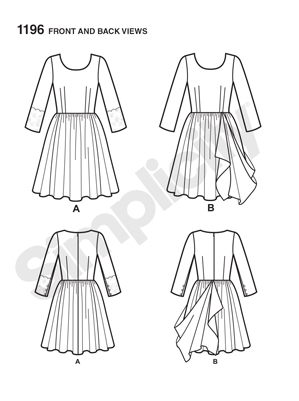 S1195 – I really like this SewStylish dress pattern too! Love the use of lace on the shoulders of the black design. S1196 – A Leanne Marshall dress design. Normally I am a fan of her patterns, but for me this one is kind of dull. Line drawing of the Leanne Marshall pattern. and the pants, jacket, and skirt aren’t bad either. particularly exciting, but I could see how they might be very practical. S1197 – 1960s Vintage reprint dress and coat. The 60s is so not my ear, but these actually pretty cute. The color blocking works well with modern trends. 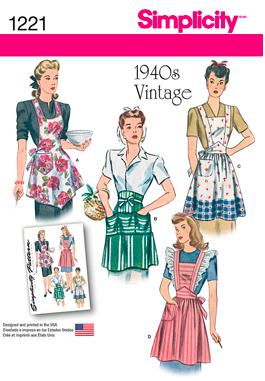 S1221 – 1940s Vintage aprons reprint. I don’t often buy apron patterns, but these are pretty cute. 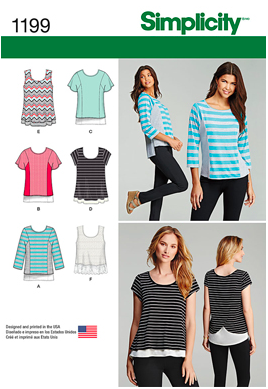 S1199 – Blousey knit t-shirt patterns. It is fine, but nothing overly exiting. 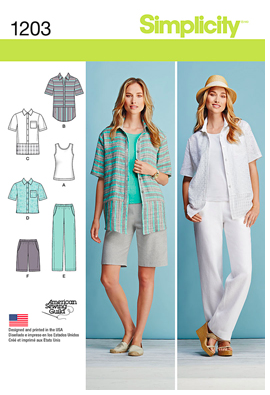 of a lot of the Burda patterns from last year. 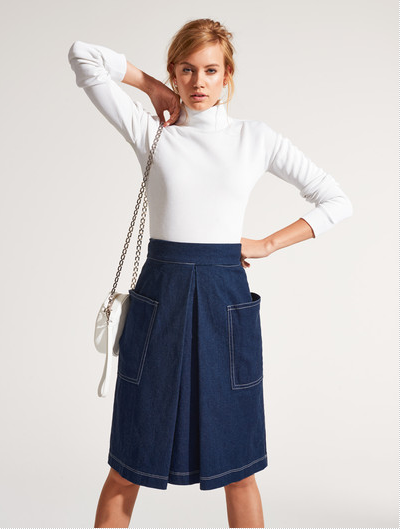 S1201 – Knit skirts. 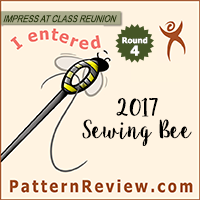 Another pattern that is fine, but not overly exciting. S1200 – Circle skirts. 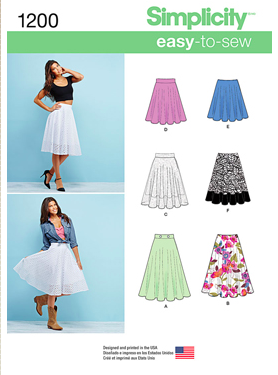 Cute, but I’ve got a lot of circle skirt patterns already. S1220 – Doll clothes. 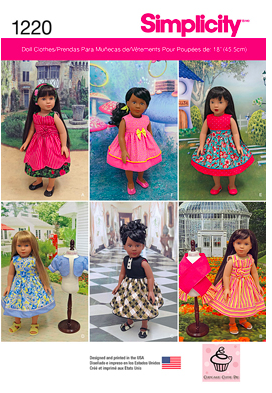 Cute, but sort of generic doll’s dresses. 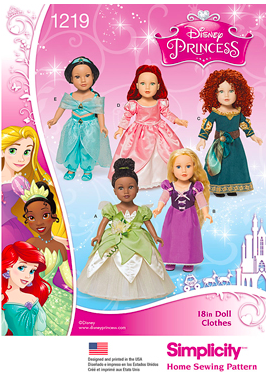 S1219 – Disney doll patterns. These are really cute! 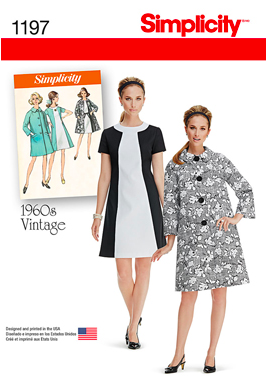 Burda has also released their sneak peak of the February issue. Based on the early preview pictures… I’m not too excited. Based on a more complete preview on P-an-da blog… I’m still not too excited. 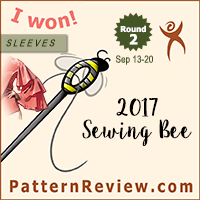 I mean, yes, there are a few things I’m pretty sure I’m going to want to make, and a couple others I might like when I can see the line drawings and not just the garment photos made in a crazy print fabric, but, on the whole, not too excited for this one. My first though was ooooh! But after looking past the cool fabric my second thought was oh. and the collar isn’t doing much for me either. we’ve already got how many in recent months? Crop tops: cool for the younger crowd. I am not a part of the younger crowd. The skirt has pockets. Pockets are cool. The length is awkward. but I dunno how I feel about the giant pocket placement. Boxy jacket is boxy. I’m going to like it better in the longer length. only in an awkward mix of prints. Not loving the fabric choices here. I’m sort of liking the way this dress fits the model. The extra drape on this skirt is a bit too voluminous for me. Burda has done similar, but more subtle versions in the past that I prefer. We get lots of white tops in this issue. Not a fan of this one – the volume is a bit much. Same as the pink skirt we saw above. Why do all of the white tops have so much volume? The Plus section looks really classy this month! Love the coat and the dress. Nice basic pants and top. Hmmm… maybe not everything is super classy. I actually like the jacket, and the pants, but not together. The kids section looks really good this month too. 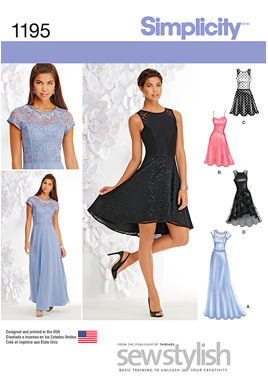 Lots of pretty dresses and formal wear. This little suit is adorable! So, what do you all think? See anything in either of these releases that tickles you fancy? Or are you sort of bored with most of these designs like I am? Feel free to discuss your thoughts in the comments! 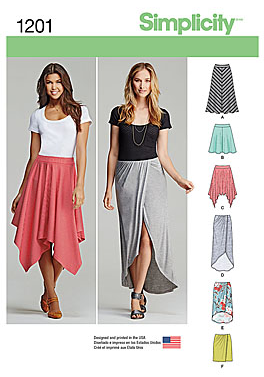 I like the skirt with the front pleat- pockets and all. 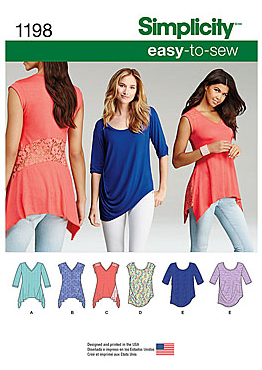 Funny how the pleat on the shorter, pink version doesn't seem to meet at the top. Nice shapes there – pity about the two tone knit dress.